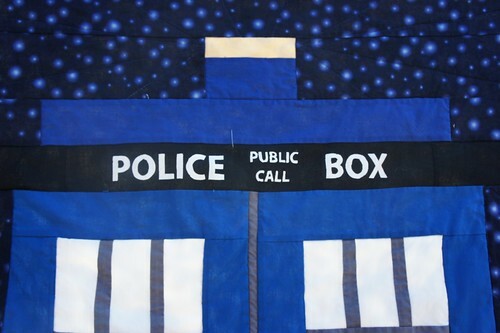 A week before Sewing Summit an old friend contacted me and wanted me to make a Tardis quilt for her to give as a gift. The catch? She wanted it before Halloween (the recipient’s birthday — no it wasn’t me — obviously, hehe.) I knew I was going to be gone for 4 days for Sewing Summit, and that even if I took it with me I wouldn’t get anything done on it in SLC, so I basically had 2 weekends to knock a whole quilt out. I sketched it up in my notebook pretty quickly and estimated the fabric. Then we started hunting for the perfect background and backing fabrics. 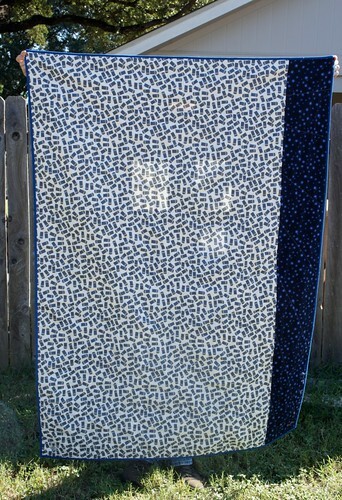 (The rest of the quilt is in Kona solids.) 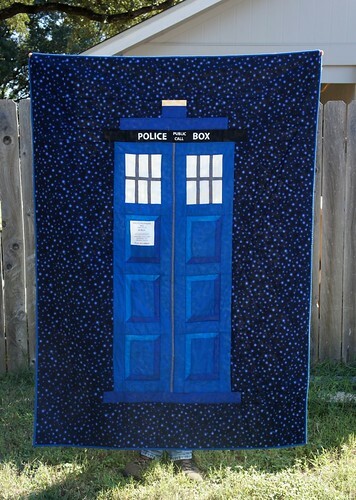 The backing was pretty easy, there is this teeny tossed Tardis fabric on Spoonflower. 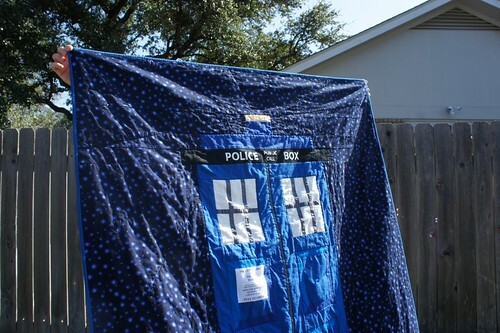 (I’m really starting to think there are an awful lot of closet geek sewers and quilters.) So my friend ordered that and had it sent to me. The background was a different story. We searched and searched for something “starry”. Finally I went into my LQS, and found this print by Robert Kauffman. It’s “Mixmasters Luminescence.” (On a side note, I can’t believe I spelled luminescence right on the first try!) I took a photo with my phone and texted it to her to get her approval. Don’t you just love technology? How in the heck did people survive before they could take pictures of fabric with their phones?! The signs were my biggest problem. I knew I could print the black on white text on with a printer using the freezer paper method. We actually went and bought a new printer during this process because the inkjet we had only had pigment (which is more permanent than dye-based) ink for black. The new printer does color with pigment inks, too. I’m excited to try that out soon. The white text on black had me stumped for far too long. I finally realized I could use silk screen ink with a freezer paper stencil (yeah, I love freezer paper) and print my own sign. I love how it came out. I was also asked to embroider a little message on the back, and this is what I came up with. 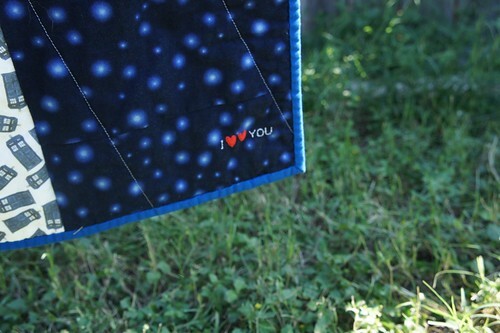 I actually did the “I” and the “YOU” on my machine, and hand stitched the red hearts. You can also see that the spoonflower fabric wasn’t quite wide enough, so I added a strip of the background fabric to finish it out. 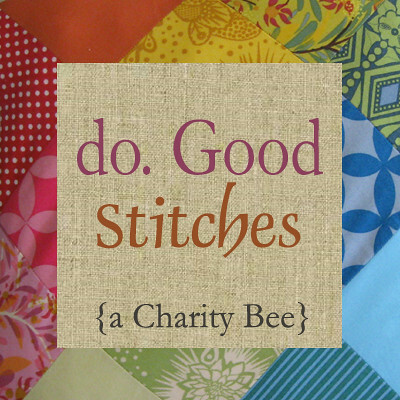 The quilting doesn’t show up well in these pictures at. all. 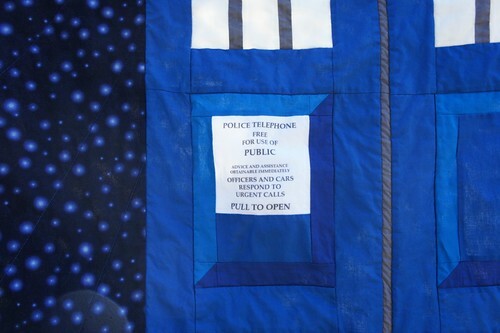 But I quilted in the ditch around the Tardis, and then in radiating lines from the “light” at the top over the rest of the quilt. It’s not a ton of quilting, so the whole thing is still rather soft and snuggly. Even though I was worried that I wouldn’t have time to get this quilt done by Halloween, I actually finished and bound it (in a solid Kona blue) a few days early. It was really quite a simple quilt to put together once I solved the issues with the text fabrics. Of course, I could have had those printed at Spoonflower, but they take FOREVER and if the sign was the wrong size it would be a major disaster. On that note, I started a new geek job, so I’m kind of stretched for time these days. 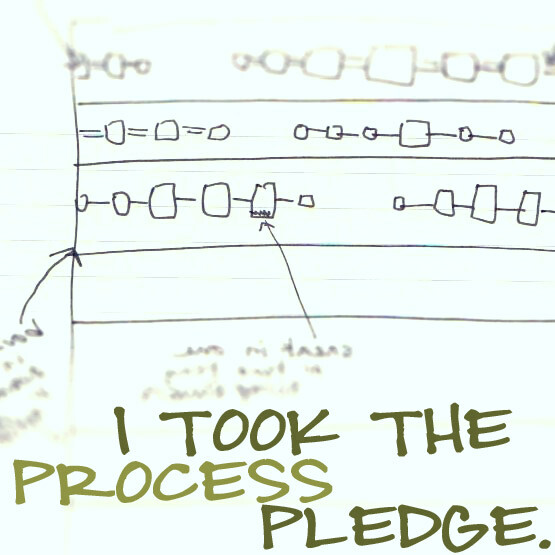 I’ll try to keep the blog updated, but don’t worry, I haven’t disappeared off the face of the Earth… yet.